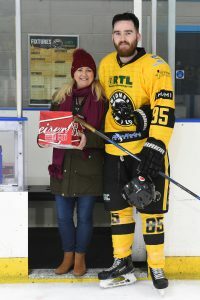 The RTL sponsored Widnes Wild stormed back to the top of the Laidler Division table with a sensational 7-2 victory over fellow title challengers Altrincham Aces at Silver Blades Widnes on Sunday. 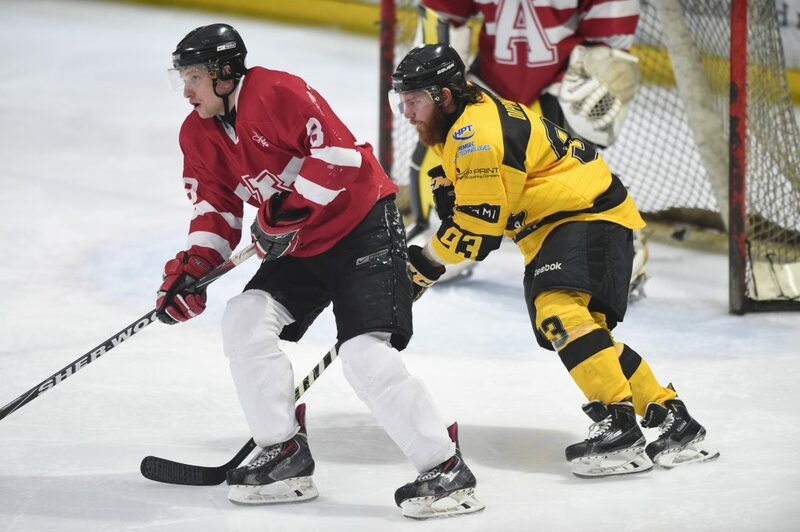 The game was given extra zest after the Wild’s win away at Deeside the night before – coupled with erstwhile league leaders Hull Jets losing away at Telford – which left the top three teams all on 30 points from 20 games. With Hull not playing on Sunday, it meant that the winner of the Wild v Aces game would take over at the top of the league table, adding even more significance to what was already a highly anticipated fixture. The game was played at a furious pace throughout in front of a huge and vocal crowd and, after a very closely contested start, the roof was nearly lifted off the rink when Stuart Brittle opened the scoring for the Wild after 8 minutes. There followed a rather niggly phase with both sides picking up roughing penalties and then the Aces’ John Murray picked up a 2 minute penalty for tripping followed by a match penalty for abuse of an official. During the ensuing powerplay, Wild captain Simon Offord scored a priceless goal that sent Widnes into the first break with a 2-0 lead. The second period saw the Aces looking much more controlled and dangerous and they out-shot the Wild by over two to one. However, despite only managing 6 shots on the Aces’ net all period, three of them went in and goals from Ollie Barron just 1 minute from the restart, Danny Bullock on 25 minutes and then a superb shorthanded goal from Barron on the half way mark put Widnes 5-0 ahead with some thirty minutes left to play. A powerplay goal from Altrincham’s Joe Greaves after 31 minutes gave the Aces some hope and then, with another strike from Greaves in the 38th minute, Altrincham looked to be back in the game. They put the Widnes defence under immense pressure in the latter stages of the second period and the early part of the third but the Wild players rallied round and even successfully saw off a 3- against-5 situation as the Aces’ attack laid siege to Matt Croyle’s goal. The pressure cooker atmosphere in the rink was relieved somewhat by a strike in the 52nd minute by Wild’s Mike Mawer and the Altrincham threat seemed to fade after that. The final goal of the night was scored by head coach Ollie Barron in the 56th minute – his third of the night and eleventh goal of the weekend – and the 7-2 victory meant that Widnes leapfrogged both Altrincham and Hull to go top of the Laidler Division table. The situation at the top of the league table is fascinating with the top 5 teams separated by just 4 points. The Wild are top with 32 points but they have played a game more than Hull who are in second with 30 and those two teams meet on Humberside this Sunday 14th January in what is a “must-win” game for both teams. The Aces drop to third place with 30 points from 21 games but all of the top three teams could be overtaken by 4th place Sutton Sting if they were to win their games in hand. Telford Tigers are in 5th place in the table with 28 points, having rallied of late but they have played more games than anyone else in the top 5. The RTL sponsored Widnes Wild travel to Hull on Sunday to face the Jets in a 5.15pm face off. They are next at home the following week – on Sunday 21st January – when they entertain the Bradford Bulldogs at Silver Blades Widnes – 5.30pm face off. While the men’s side are away in Hull, the Widnes Wild women’s team are in action at home this Sunday 14th January when they entertain league leaders Chelmsford Cobras in the Women’s Premier League at Silver Blades Widnes. The Cobras finished second in the league last season and have won all 5 of their league games this season so far, conceding only three goals in the process. The Wild women are currently fifth in the WPL table and picked up their first win of the season with a 0-2 win away at Nottingham Vipers in mid-December. The game faces off at 5.30pm. The Widnes based Halton Huskies recreational team picked up a creditable 5-5 draw in a challenge match away to the Sheffield Mavericks on Sunday night. The goals were spread across the team with Ric Evens, Daniel Trust, Nathan Hewitt, Edward Ridding and Michael Parkin all finding the net. The Huskies have a home game on Sunday 21st January after the Widnes Wild league game against Bradford Bulldogs. The Huskies game faces off at 8.30pm and admission is free.